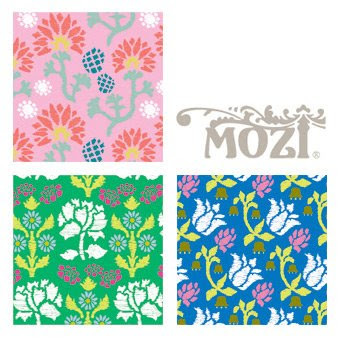 I'm so proud that the fabulous MOZI brand is Australian and have proclaimed my love for their product range before. And I'm happy to let you know about the new Silk Road design launch. The colours, scents and patterns of the range are inspired by destinations along the silk road (think a shimmering Taj Mahal, lolloping camels laden with treasures, jewel-hued saris, handwoven Persian carpets, and ornate jars of spices). You'll also find matching fragrances in room sprays, soaps and candles such as "Persian Peach" and "Preserved Citrus Fruits". The Silk Road range is available now from the MOZI website and stockists around the world. And in the tradition of cool brands, MOZI is launching a limited time pop up shop in Melbourne. From 23rd April - 2 June 2009, you can find everything MOZI at 763 Glenferrie Rd, Hawthorne. Hi Steph, thx so much for sharing this! Love the Silk Rd theme. I might go and have a squiz at the shop in Hawthorn. It was my bday recently and on the weekend just past, a friend of mine gave me two Mozi mugs from the Secret Garden collection. The designs are really lovely. You lucky thing - being so close to the pop up shop AND receiving the mugs! Happy Birthday! My birthday was recently too (Fri 17th April). I love these designs! They so remind me of spring! Hi Emily - you're right! Very good for children. I say this for encouragement. Succeses!